I while I was feeding the CNC I poked around my shop looking for inspiration. I found an old hunk of heavy industrial electrical conduit, steel plate, and some copper scraps — and decided I’d make a glue pot. I sawed off a length of the conduit and sanded it to remove the zinc coating. Zinc screws up the welding, and it’s toxic to breathe the zinc fumes. 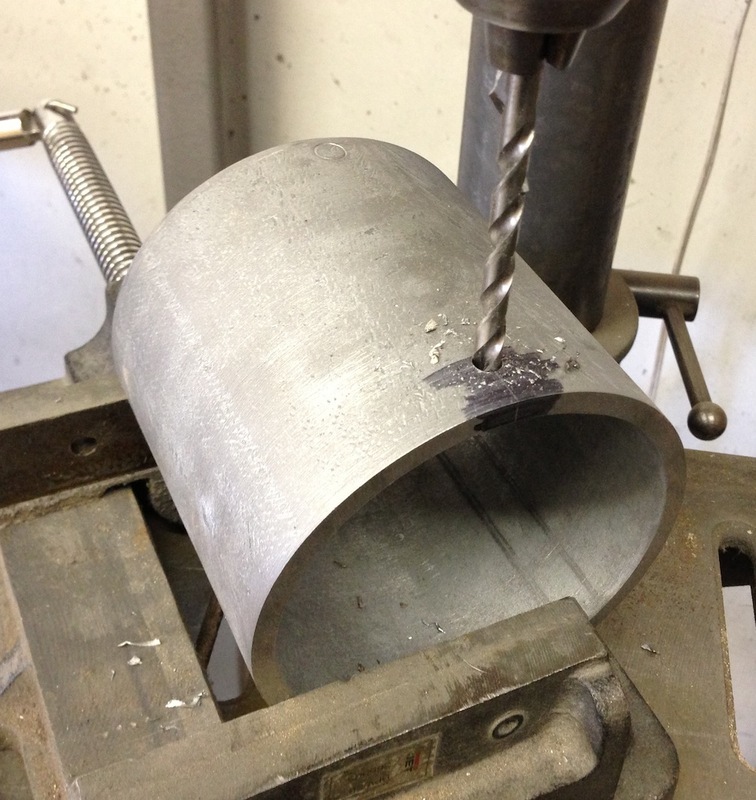 I also cut out a disk of steel plate about the same thickness as the tube. I welded the disc to the tube, mostly that went OK. I’ve been welding so much cast aluminum for the past few years that I’m out of practice on steel (and everything else). I had a little contamination from the zinc, and I had the weld too hot. But mostly I was doing this on auto-pilot, trying not to think about work, so it’s not my best work. But I kept the mill fed (every 18 minutes and 30 seconds I have to take out a finished part and put in a fresh piece of material) and I didn’t think about work at all. I laid out and drilled two holes for the handle pivots. I bent the handle out of some 1/4″ x 1/2″ flat steel bar from the scrap pile. 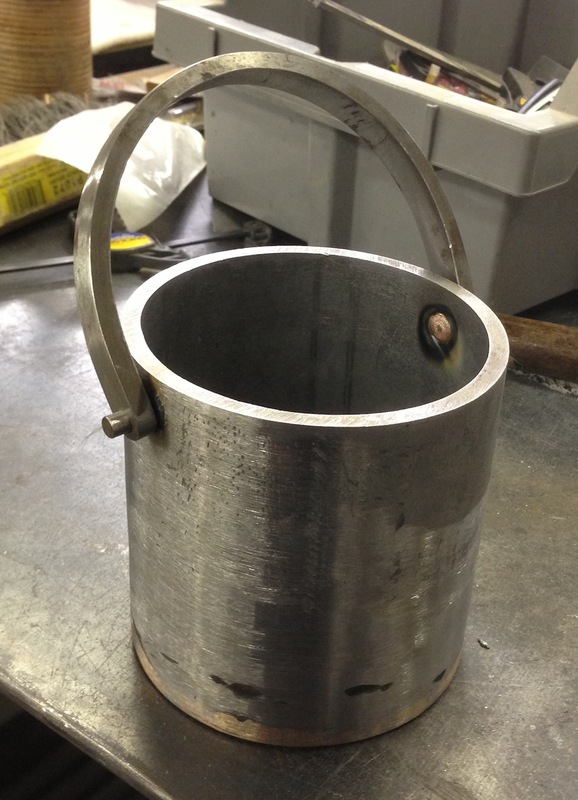 I pressed in two steel pins for the pivots and welded the end on the inside of the pot to hold them in place. Then I started on the copper liner. 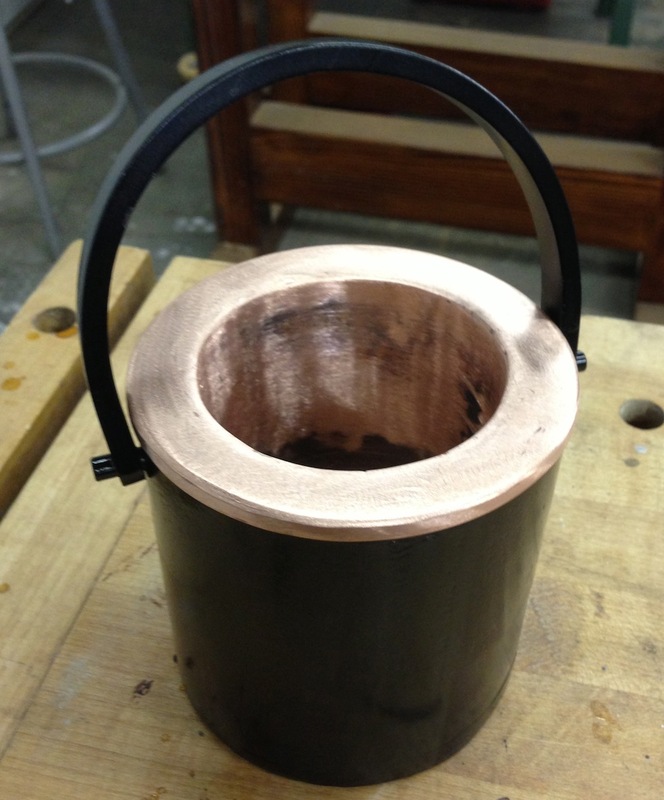 The round tube is a 3″ copper pipe coupler. 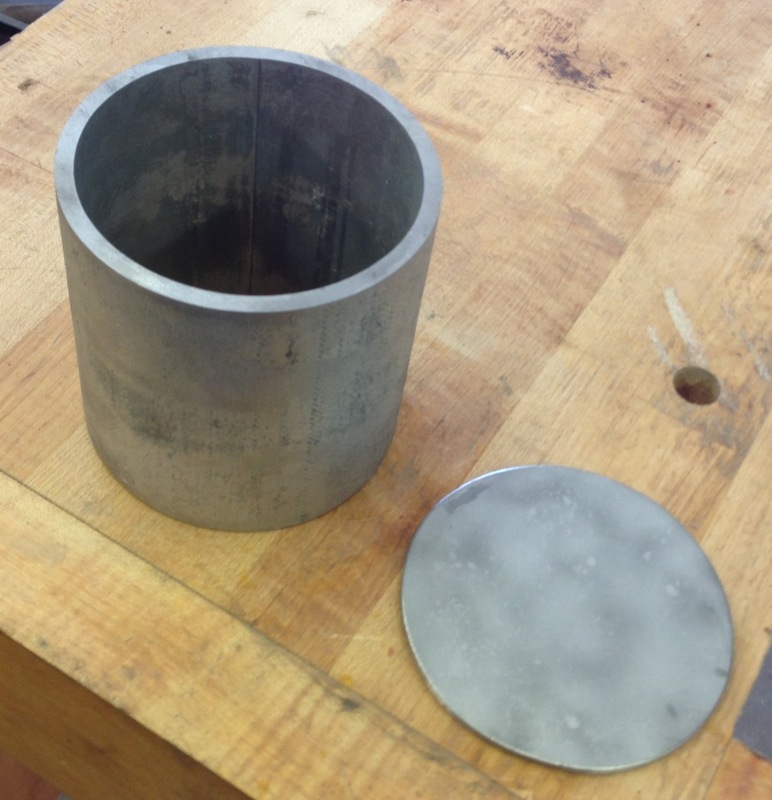 The layout on the flat sheet is for the top, a hole for the tube, the OD of the steel jacket, and a small allowance for a turned lip to hold it in place. 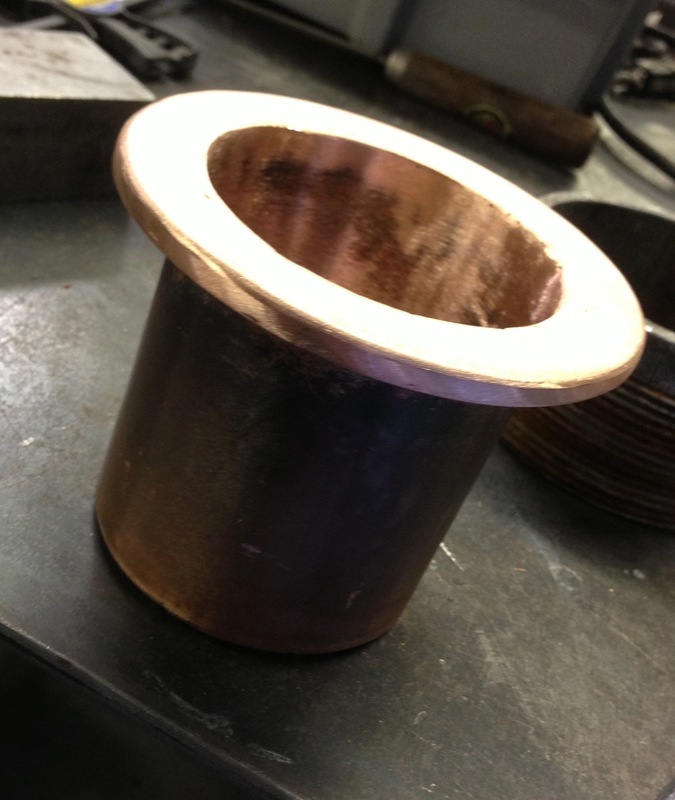 I welded a copper disc on the bottom of the copper tube. The steel block is just a weight to hold it in place. 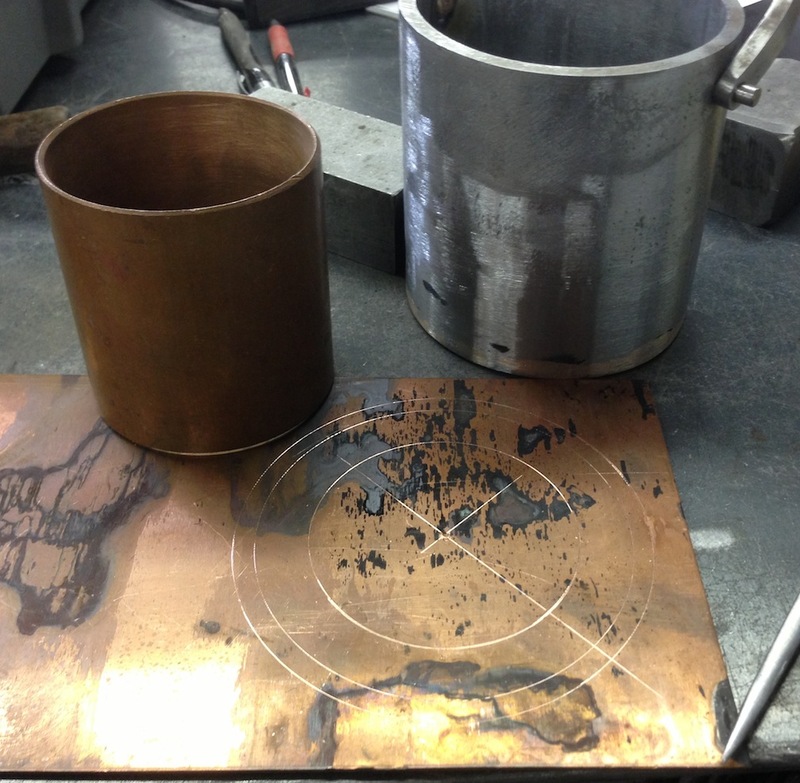 Copper is funny to weld. 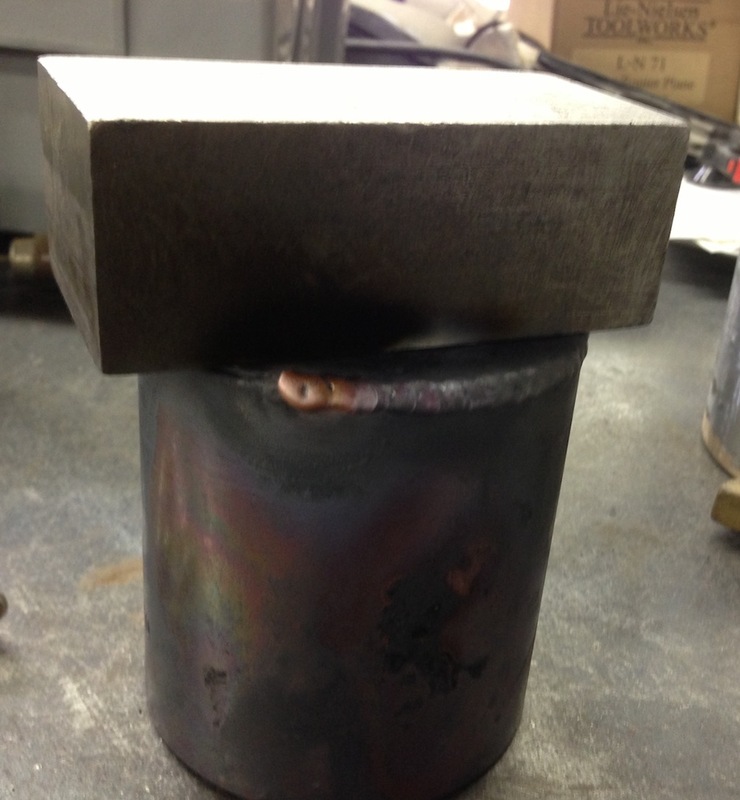 It conducts heat like crazy, the hole part gets hot before the weld will start. It doesn’t really change color when it’s ready to puddle either. I ground the weld smooth after it cooled off. I used a 3.25″ hole saw to cut a hole in the middle of the top sheet, then used a beverly shear to trim the part to the outside layout line. After welding on the top flange and grinding the weld smooth I hammered the edge over so it would register on the steel jacket. The work isn’t perfect, but, again, I didn’t think about work at all so I’m pretty happy with it. I gave the steel jacket a couple of coats of high-heat semi-gloss black engine paint. I’ll let that dry for a day or so, but otherwise it’s ready to put to work. I need a wood project now so I can try it out. I’ll probably make a lid some day, but I’m done for today. It’s a heavy glue pot, it should hold heat really well, I can’t wait to try it! 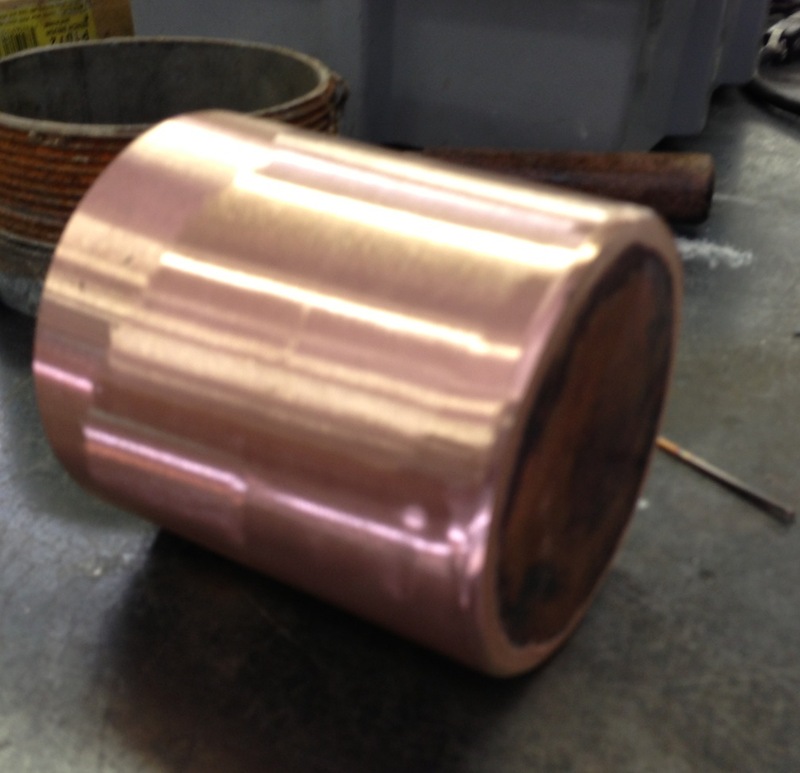 I really like the use of copper it will provide even heating and looks great. I read somewhere that it helps the glue stay fresh longer – that might be an old wives tale, but that (and not rusting) was why I used it. Wow! I still think you have a future in selling to all those woodworkers out there. Very cool! Now that is a glue pot! That looks amazing. I envy your metal working skills. I’d say that glue pot will serve you, your son, and his children and grand children. Your ability to just bang these kinds of things out is amazing to me. I’m sure you can do this autopilot because of years and years of experience with this, but still… wow. Very nice. very nice. 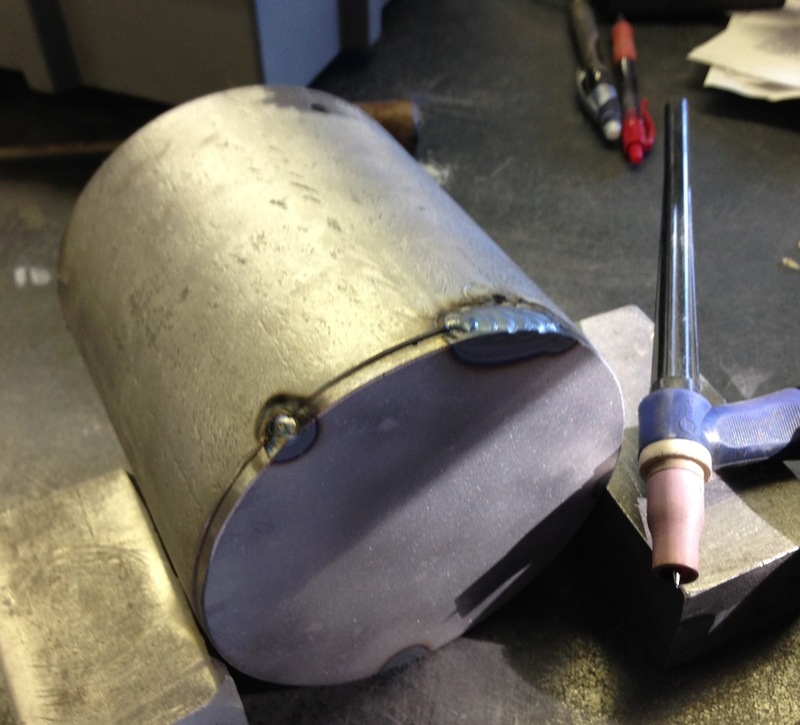 Since you do an amount of aluminum welding, did you eve consider doing the outer pot out of aluminum and the inner from copper? It would seem the aluminum would heat up faster. Not sure about any electro-chemical reactions the aluminu might offer, but it is used in cookwear a lot. 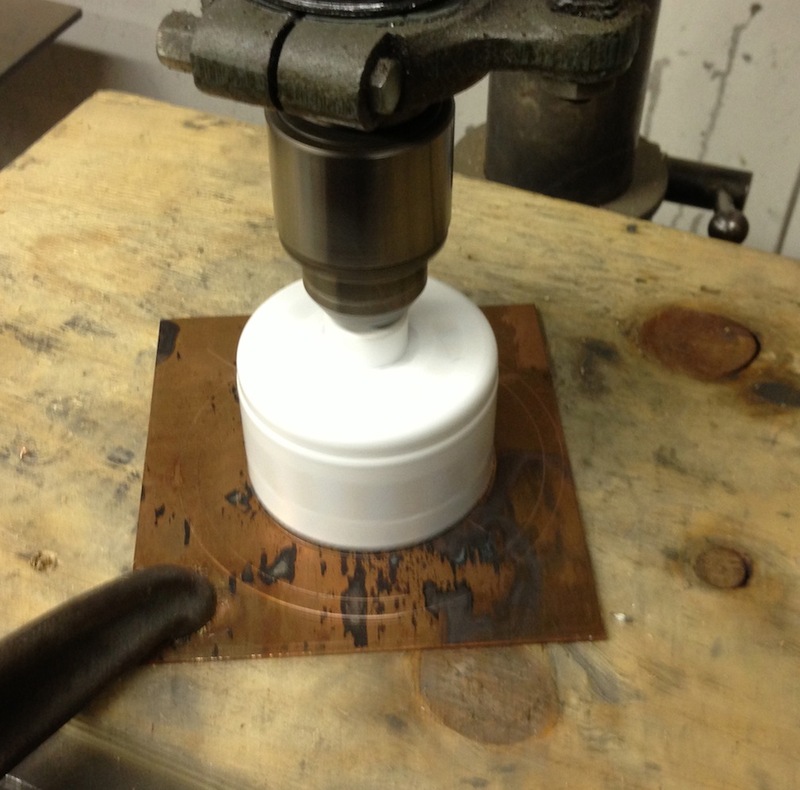 Aluminum for the outer pot would work fine. It would probably be OK for the inner even, I’m pretty sure I’ve seen an aftermarket one that had an aluminum liner. I did steel and copper just because it was sorta traditional, and I had most of the bits in my junk pile already. 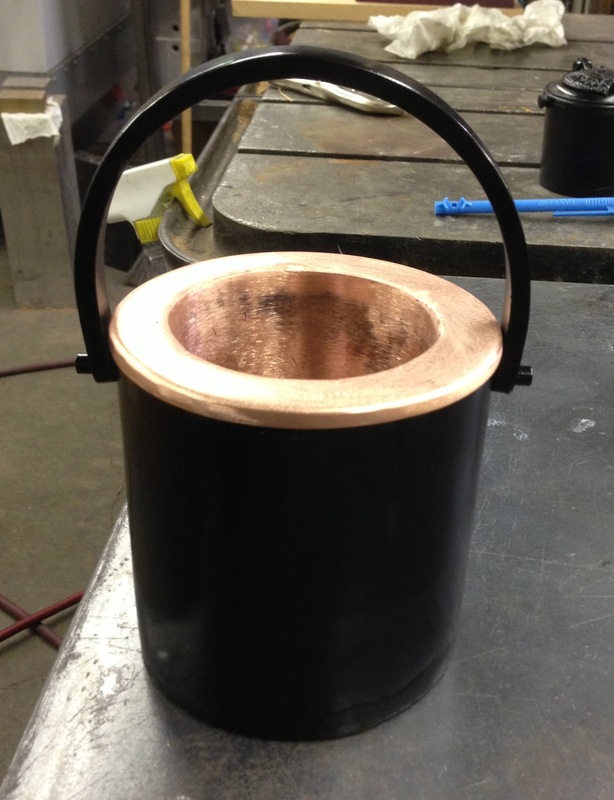 Personally, I think copper was a very good choice for the inner pot. Non-ferous. Aluminum reacts with some woods and stains them off colors (aluminum and Koa go bright green), so I don’t know if the aluminum might leech some chemical change for the inner pot and glue. Many luthiers use an enameled (glass) steel inner pot, but the strength of the hide glue drying eventually cracks the glaze due to it’s drying strength. I have a friend that uses hide glue pots always, and he had a friend make and all ceramic glazed inner pot for him that works very well.